A new countertop instantly updates the look of your kitchen and adds value to your home. Aero Kitchen offers a wide selection of Granite, Quartz and Laminate. Please note that this is just a small sample of what we offer. If you do not see it here, we will do our best to get it for you. 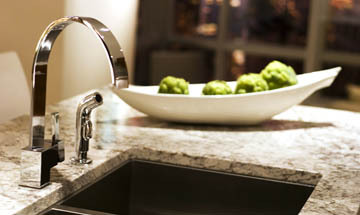 Granite countertops are scratch, stain and heat resistant making for an ideal kitchen surface. Each slab of granite is slightly different giving you a unique character to your room. If you are looking to enhance and beautify your kitchen or your bathroom, think about a granite countertop. Quartz is the hardest non-precious stone that can be found on the earth's surface. No sealing, polishing or reconditioning is required. Quartz is very much in demand because of its consistent pattern and low maintenance.. The most familiar of all kitchen countertop materials, laminate is versatile, dependable, and relatively inexpensive compared to other countertop materials.